My son woke up at 5 am and demanded breakfast. That is way too early for me! So after he was fed and content, I decided to treat myself to a really good breakfast and I used the quiet morning to create this yummy granola recipe. I’ll definitely be making it again. And again. Blend banana, agave nectar, oil, salt and cinnamon. Mix oats and nuts and pour mixture over. Bake for app. 30-40 min. Stir once in a while to ensure even browning. Add dried apples and rice krispies when done. Store in airtight container for weeks. Though I bet you it won’t last that long! You can really play with this recipe. Use your favorite sweetener eg. honey or maple syrup. Use more if you like it sweeter than I do. Add your favorite dried fruits and nuts. Try different spices eg. vanilla, cardamomme, ginger, nutmeg etc. 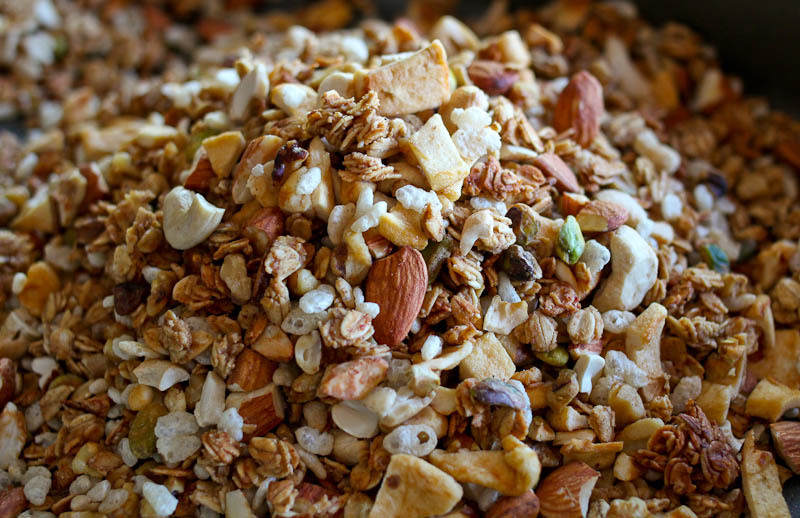 This entry was posted in Breakfast and tagged apple granola, breakfast, granola, healthy food blog, morgenmad, nutty granola. Bookmark the permalink.